In order to allow your clients to upload a document securely and directly into their case record, you need to send them an invitation. This invitation will be by an encrypted link, that only they can see, and will be good for only a limited amount of time. 1) From your home screen, click on the appropriate case. 2) When your case record opens, scroll down to the Contacts section. 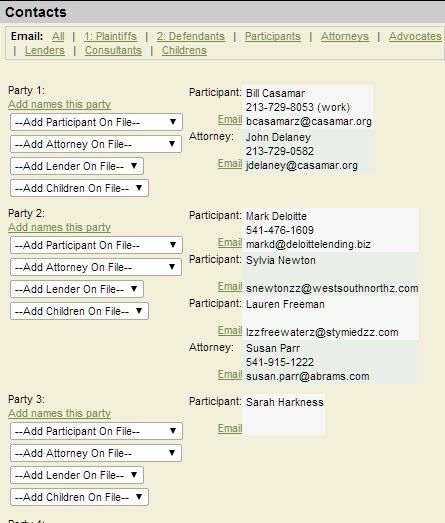 You can then email people as a group ("All", "Participants", "Attorneys", etc.) or individually. If you want to email them individually, for instance, click the "Email" link next to that person's name. 3) Your Mail Manager window will open. 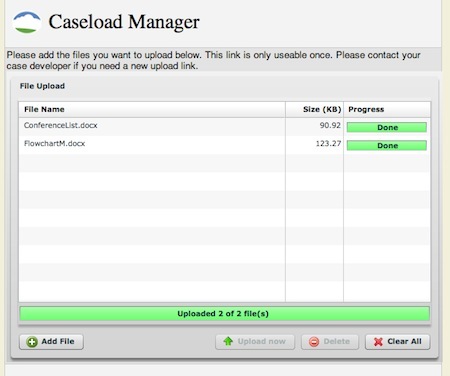 This triggers Case Manager to create a safe place for them to upload documents. 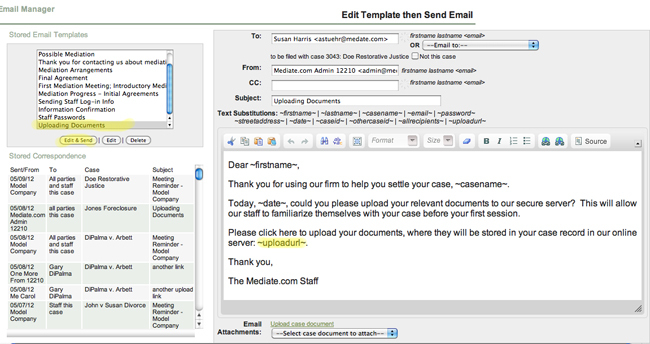 The words ~uploadurl~ will change to a form when the client opens the email. They will need to click the Upload button that they see in their email. This will take them to an online form. From that form, they will be able to browse their computer, select the appropriate files, and upload them to the case record. They can simply close that screen when they are done. Upon closing, that url is no longer active. Upload is thus for a limited, one-time, secure use by the person who received the email. If additional upload opportunities are desired, the participant can conveniently contact staff with this request. Staff will be able to verify in the case record who uploaded the documents and when.